Dimensions 1.50 by 5.75 by 9 in. Amazon.com description: Product Description: English scientist, naturalist, and geologist CHARLES DARWIN (1809-1882) transformed our understanding of the planet and our place on it with his theory of evolution through natural selection. Much of the basis for his conceptual breakthrough was his research during the five-year journey he undertook on the HMS Beagle, an English exploratory vessel, which sailed South America and the South Pacific from 1831 to 1836. First published in 1839 under the title Journal and Remarks, this replica volume reproduces the 1845 second edition, originally called Journal of Researches. 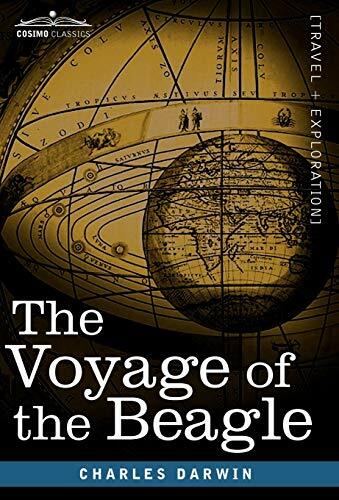 Enthralling both as a tale of travel adventure and as a naturalist's diary, The Voyage of the Beagle is even more fascinating for the hints it offers, from decades prior to Darwin's publication of 1859's On the Origin of Species, of the observations of the natural world and the thought processes that followed that would combine to revolutionize the field of biology.